Although there are many styles of standing desks, today we look specifically at what we believe are the best standing desk converters, allowing you to convert your current desk into a sit-stand work desk. 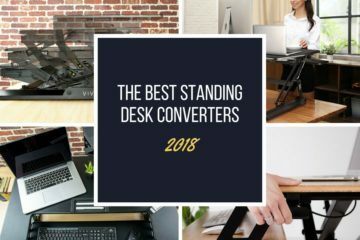 These products come in a variety of styles, which we will discuss a bit later, but to start with, here is a quick overview of our favorite standing desk converters of 2019. These desks have been picked for their high-quality builds, the functional design, and how well they have been reviewed by their users. Although each desk is slightly different, and every desk has received a different final rating, rest assured that any one of these desks will do a great job in getting you up and standing. Pay attention to the minor differences, however, as these often come down to personal preference, and what suits one person may not necessarily suit another. Why should I stand at work? Leading a sedentary lifestyle can have many negative consequences for your health. Apart from the obvious weight gain, it can lead to stress, anxiety, and many aches and pains. It can also lead to serious illnesses, such as diabetes, atrophy, and cardiovascular issues. Even if you exercise, sitting for excessive time periods can damage your health in the long run, so you should seriously try and limit your sitting time and consider a standing desk as part of your daily office routine. Luckily, there is a solution to that problem, and it is called a standing desk. It may be a bit strange at first to stand while working but, as soon as you start doing it, you can be sure to notice a change in your energy levels, alertness, and productivity. Your blood circulation will improve and you will start to get rid of neck and back pain. Therefore, if you are an office worker, consider buying a standing office desk that will allow you not only to stretch your legs a bit after sitting for some time but also even exercise while working. Many people decide to add treadmills and other office exercise equipment to complement their new “healthy” office. What Are Standing Desk Converters? There are two main types of adjustable standing desk. Height adjustable standing desks are a full desk which replaces your existing desk. They are generally larger and more expensive, but many people prefer just having the one desk. A standing desk converter does NOT replace your current desk, it sits on top or clamps to your existing desk to convert it into a standing desk. This option is usually (but not always) a bit cheaper and generally preferred by those who like the extra maneuverability, that is, you can use a desk converter on any desk, anywhere. Standing desk converters aren’t only meant for enabling you to stand while working. You can sit for as long as you like and, as soon as you want to stand up, you can adjust the height of your standing desk converter in just a matter of seconds and continue your work. Although they all essentially achieve the same goal, they all have their benefits and drawbacks. For this article, we focus solely on x-frame and z-frame desk converters. In our opinion, z-frame and x-frame standing desk converters are the most user-friendly as is seen in their popularity over other styles. They were also the first style of standing desk converter that was developed, and they have really stood the test of time. SIMBR Standing Desk Converter is a height-adjustable sit-stand desk riser with adjustable keyboard computer workstation for home and office. If you want a standing office desk, SIMBR standing desk converter might just be your best choice. It provides you with a very spacious work area that has two separate tiers. The top tier, with the surface of 35.4” x 22” can hold two side by side monitors, or a laptop with a monitor. It can also hold your tablet, your phone, notebooks, pens, coffee mugs, and every little thing you generally keep on your desk while you work. It even has an instant tablet integration design for holding your tablet or phone while you work. The second, lower tier is the removable keyboard tray for your keyboard and mouse, which you can easily remove with the hex key wrench from the package when you need to use a laptop, and you can install it again just as easily. It has a surface of 35.4” x 7.5” and can support the weight of up to 2 kg. The best part about it is that it provides you with enough space for your wrists but, most importantly, the surface is placed in an ergonomic position. SIMBR Standing Desk Converter has a very sturdy steel frame with the highest possible load bearing, and its gas spring enables a very easy and smooth height adjustment, going from the sitting position to standing in just a matter of seconds when you gently pull the height-control handle on the side. What’s great is that you are not limited to two particular surface heights (sitting and standing), as you can set the height anywhere from 6.3” to 19.7”. FlexPro Air Standing Desk by Stand Steady is a precision desk converter with hydraulic lift assist, which means that it is a sit to stand desk converter that can instantly change any surface to a standing office desk. You can easily switch between sitting and standing with an air pump lift assist that can help you either raise or lower your work surface, and it raises straight up and down due to its x-frame design. It is about as easy a changing the height of your office chair, so you certainly have a pretty good idea of how easy it is to adjust the height of this standing desk. FlexPro Air Standing Desk comes with two large surfaces that give you a very spacious workstation to complete your daily tasks at. The top surface of 36” x 16” can fit two side by side monitors. The keyboard tray of 35” x 19.5” is one of the largest you can find and has a perfect ergonomic design to help you keep the pressure off your wrists. 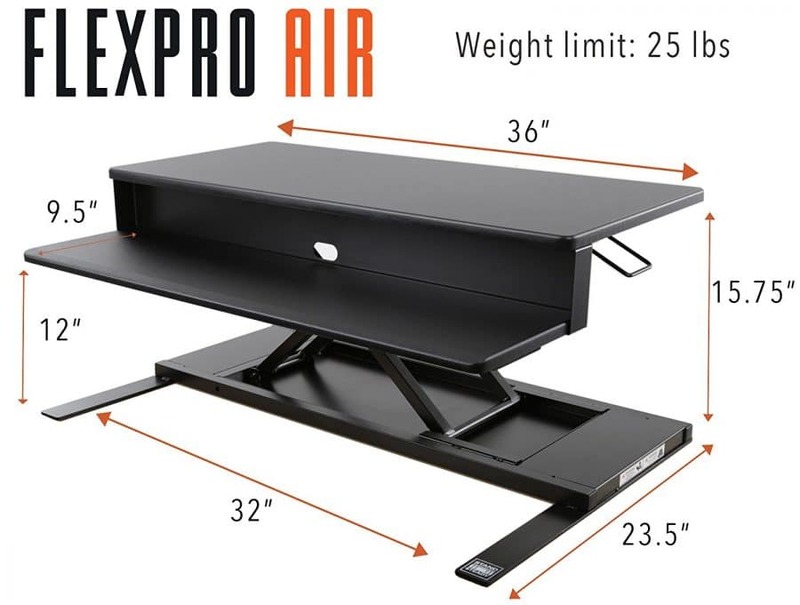 At its lowest height, the FlexPro Air Standing Desk’s monitor level is 5.5” off desk, while the keyboard tray is flat on the desk. At its tallest height, the monitor level is 16” off desk, while the keyboard tray is 11” off desk. This standing desk converter can support the weight of 25 lbs, and it even has non-slip grips, so that it cannot slide and, of course, doesn’t damage the desk beneath. It also has a magnetic backboard which is 36” long and 3.5” wide, as well as very useful features for cord management. If you are looking for a standing desk for a tall person, then Cooper Standing Desk Converter by Fully may be the right one for you. 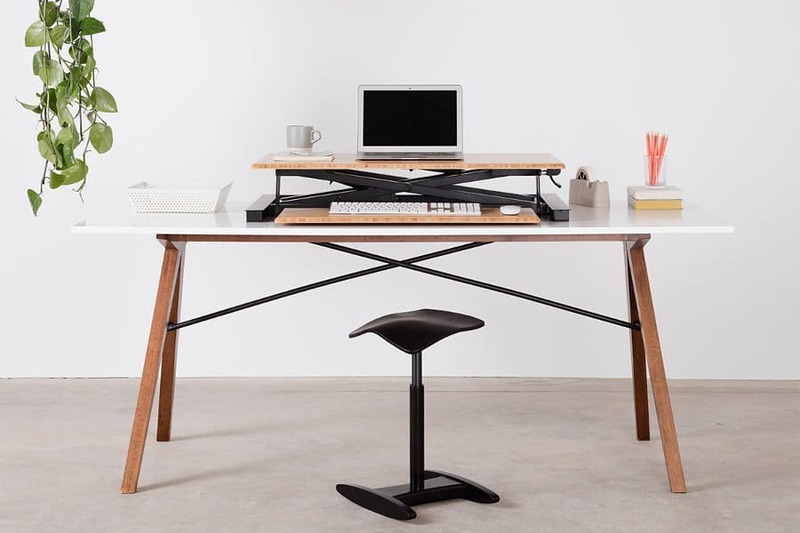 It is the best desk for tall people, as you can raise the top, monitor level up to 22” off your desk with a simple squeeze paddle (hydraulic lifting mechanism), which brings your standing desk up to 51” (including standard 29″ desk) and makes it stand above many other similar products currently available. Cooper standing desk converter has an existing desktop footprint of 36.6” x 23”, and it can support the weight of 15.8 kg. It has a robust x-frame that you can easily and smoothly adjust straight up and down, and it is designed to perfectly distribute your work surface’s weight at any set height. The monitor level has a large surface of 732 square inches, so you can easily fit two monitors or one monitor and a laptop, together with other office supplies that you need. The built-in keyboard and mouse platform has a surface of 341 square inches, giving you plenty of space to easily do your tasks. 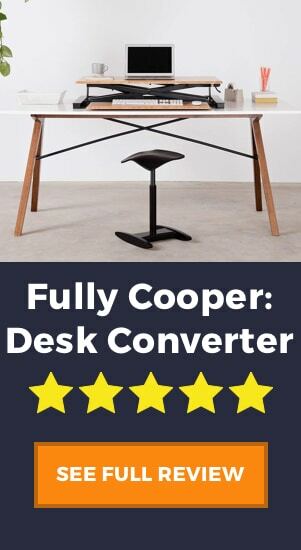 Yet another thing that makes Cooper standing desk converter stand out is its durability and eco-friendliness. The tops of both monitor and keyboard platforms have a bamboo finish that not only gives the desk a modern and very aesthetic look, but it also makes it sturdier and more resistant to chips and scratches, not to mention that bamboo is very environmentally friendly. Check out a more detailed review of the Cooper here. 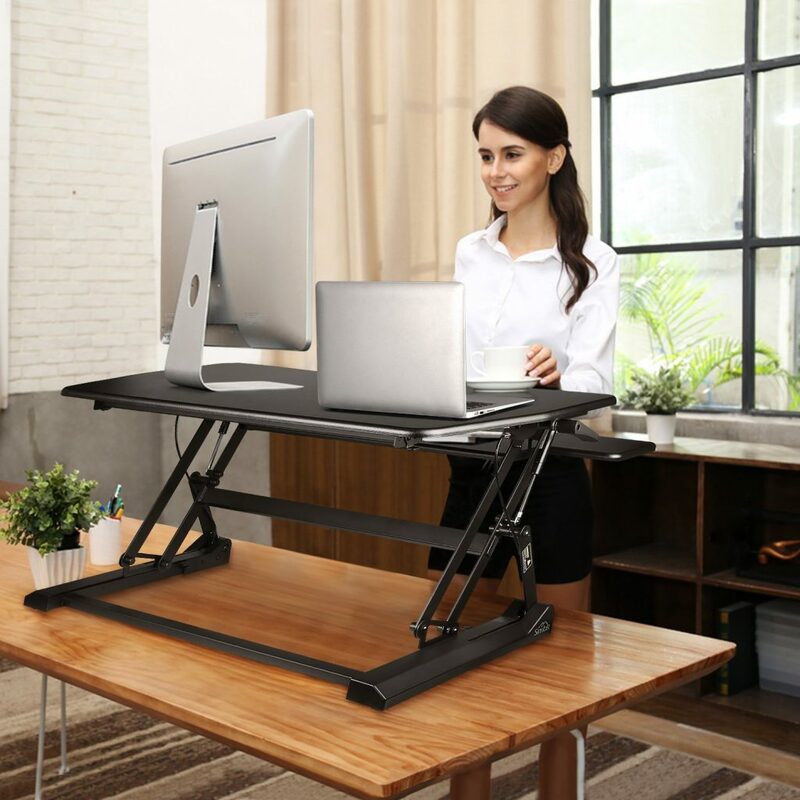 VIVO Height-Adjustable Standing Desk Converter is a sit to stand desk spring riser converter that provides you with a very spacious work area. The top surface, which can fit either one big monitor and a laptop or two side by side monitors, measures 36” x 22”. The lower tier designed for your keyboard and mouse measures 28” x 9” and sits at an ergonomic position for your wrists. What’s great about it is that you can easily remove it with the hex key wrench you get in the package when you need to work on your laptop, so that it doesn’t come in the way, as it doesn’t raise straight up and down, but moves towards you when you lift it up. In sitting position, the top tier is 6.5” from the surface of your main desk, while it can reach the height of 16” when raised to enable you to stand while working. You can adjust the height to the desired level with a gas spring lift by simply squeezing the handle, and there are 8 points of height adjustment to choose from. 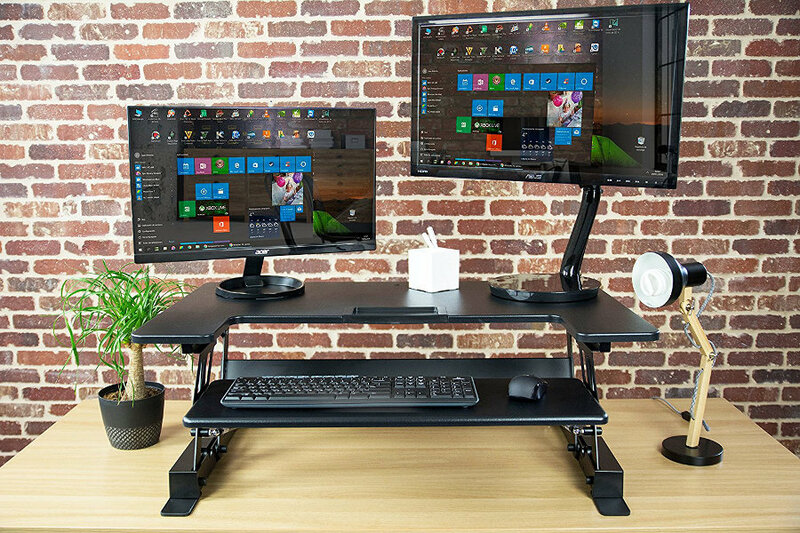 VIVO Standing Desk Converter can hold the weight of up to 38 lbs, and it even features monitor mount compatibility, so that you can use any monitor mount you choose. It also has an adhesive cable clip for cable management, which is attached to the steel frame under the surface of the desk. 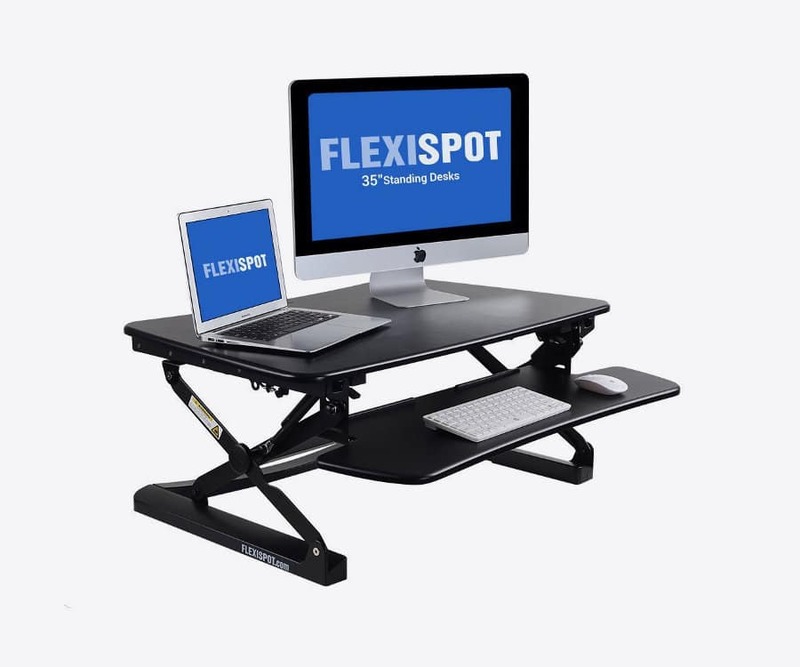 FlexiSpot M2B Standing Desk is a height-adjustable stand up desk riser with a removable keyboard tray that can make your office work very comfortable. It provides you with plenty of room for all your work materials, and it is compatible with ergonomic monitor mounts. It has a very high-quality construction and can support the maximum weight of 15.8 kg. FlexiSpot M2B Standing Desk’s workstation enables a very easy transition between sitting and standing, as its gas spring hovering system allows you to adjust its height with just a light handle squeeze. There are 12 height-adjustments levels to choose from to perfectly support your wrist and arm positions, which is pretty amazing. The workstation moves straight up and down within its own footprint, so you don’t need to make any spatial accommodations. The top surface of this standing desk measures 35” x 31.5”, allowing you to easily fit two monitors. The lower tray measures 35” x 10.8”, giving you enough space for your keyboard and mouse. When the desk converter is standing flat on the surface of your main desk, its height is 5.9”, while it can reach the height of up to 19.7” (monitor surface) and 14.2” (keyboard tray) when it is extended. It also has a unique quick-release design, so that you can easily remove it when working only on a laptop. Varidesk was the first company to create a truly ergonomic and functional standing desk converter. They are one of the big names in the industry, and their products reflect their expertise. This product is one that we have seen before in a full Varidesk Pro Plus 36 product review, so if you want a more detailed look at this desk then have a look there. The Varidesk has almost 1500 reviews on Amazon with an overall rating of 4.8/5. The frame is solid and sturdy, very little shake and can lift up to 35 lbs in 3 seconds. It also adjusts to 11 different height tiers, from 4.5″ to 17.5″. The monitor surface and the keyboard surface are separate, which is better ergonomically for your standing posture. These surfaces are also large enough for two side-by-side monitors, a keyboard, and a mouse. The main issue with the Varidesk is the space it takes up, not only on your desk but when extended to its highest height. It sits out about a foot from the desk and will force you to move back away from the table. If you have a small cubicle office, this could be an issue. Overall, the desk is one of our highest rated, and it really has gained the trust and respect of its users. It is very difficult to see anything bad written about the Varidesk and this is a testament to the quality product that it is. Want to know more about this product? Take a look at our in-depth Varidesk review. The first thing to point out with the iMovR, is a special feature that sets it apart from all the rest. The iMovR ZipLift+ has an ergonomic tilting keyboard that can adjust from a -10 degree to a +15 degree incline. In a standing position, this helps you type at a more comfortable angle and puts less stress on your wrists and forearms. Another huge benefit of the iMovR is the lifting mechanism that has infinite height adjustments. Unlike other desks that have a number of set heights, the iMovR allows you to be accurate within a whisker of the perfect desk height. It also can reach up to 20.5 inches tall, which makes this desk converter ideal for taller people. The iMovR has a z-frame so it will open up and out towards the user, meaning you have to make sure your office is big enough to fit the desk. To balance this out, it does come in two sizes, both a 35″ model and a 42″ model, depending on the size of your current desk. 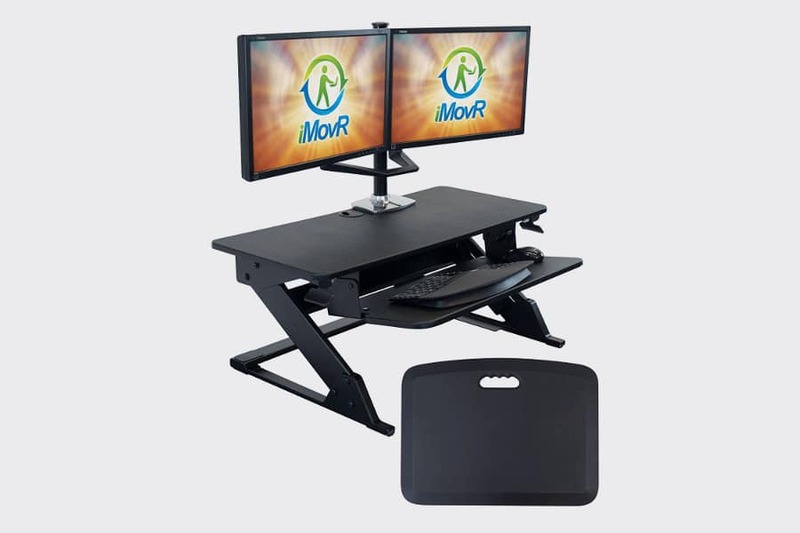 If you buy the iMovR now off Amazon, they will also throw in a free standing desk mat. Standing desk mats are great for stopping you fatigue as quickly and getting aches in your legs. We also have a full review of the iMovR ZipLift+ in our product reviews section. If you are looking for the best standing desk that will enable you to stretch your legs a bit after a whole day of sitting in your office, then you should definitely choose one of the aforementioned standing desk converters. 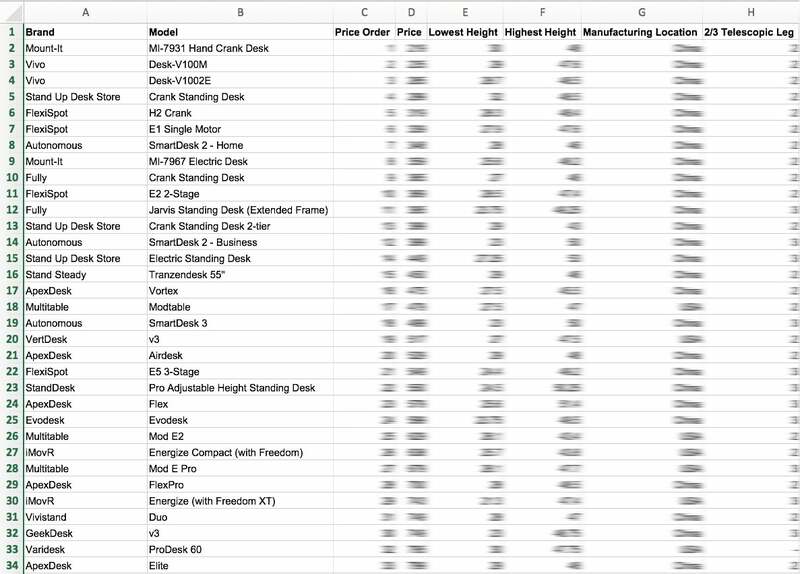 Finding the best standing desk converter can be a bit of a daunting task, as there are plenty of products out there, which is precisely why we made the effort of narrowing down the list for you to help you make an informed decision. 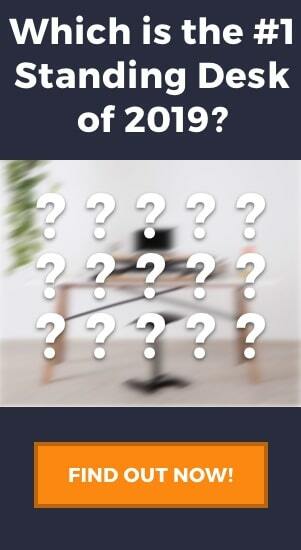 Whichever standing desk you choose out of these top 7, you can be sure that you will significantly improve your office lifestyle.